VANESSA SOMERS VREELAND trained with professor Odoardo Anselmi, art director of the Vatican Mosaic Studio in Rome and taught at Corning Museum of Glass, Penland School of Crafts, and the Columbia Museum of Art. She has had gallery shows in Paris, Rome, London, Brussels and North Africa. Vreeland's artistic path to mosaics began with painting on canvas, then on glass. She independently developed a fused glass mosaic technique and also works in marble and cold glass in traditional Roman style. Vanessa edited My Colorful Life, an autobiography of her remarkable aunt, British Portraitist Juliet Pannett. Pannett had her own seat in the House of Commons, from which she sketched Britain's political milestones - including the debates on the Profumo affair in 1963 and Winston Churchill's last appearance in 1964. When Juliet died in 2005, she left a legacy of commissioned portraiture throughout Britain including 22 portraits in the National Portrait Gallery, London. FREDERICK VREELAND, former U.S. Ambassador and U.S. Senior Diplomat to Rome and wife Vanessa's Key To Rome: A Guide Book reflects the Eternal City's layers of cultural history, from ruins of antiquity and Christian Rome to the splendor of the Renaissance and the Baroque. "Their book guides travelers through layers of time, exploring major sites and revealing insider secrets. Written in a brisk, anecdotal style, this beautifully illustrated handbook is packed with photographs, historical drawings, sidebars, foldout maps, and floor plans. The guidebook's site descriptions are framed by historical timelines and punctuated by special "must-see" highlights. A comprehensive reference section at the back details day trips of interest, a guide to Italian food, specialty shops, "Rome by Night," and "Rome for Kids," as well as transportation, hotel and restaurant suggestions." Great post. Thank you for sharing this. The light that surrounds her studio is marvelous. 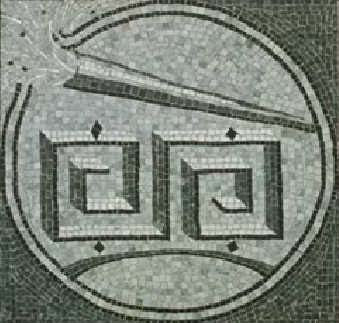 Mosaics are such a durable Roman tradition. She really understands her mediums full potential for contemporary expression with wit and artistry. Mosaics are really incredible--you always wonder if they laid the tiles first and then painted, don't you?